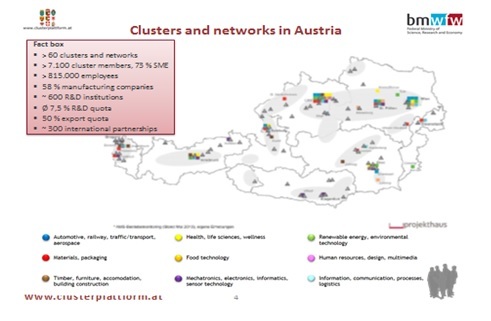 There are more than 60 clusters and networks in Austria with more than 7.100 cluster members (73 % SME) and about 815.000 employees. The clusters are linked up with research and educational institutions, co-operate with other trans-regional clusters, are involved in EU-programs and strengthen international competitiveness of Austrian companies, especially that of SMEs. In 2008 the Federal Ministry of Science, Research and Economy launched the National Cluster Platform for national and federal stakeholders in Austria. The platform is a structured strategic and working environment for cluster organizations and networks. It is important to enforce early and intensive information exchange on labeling and know-how transfer and best practices for improving cluster management. The focus of the activities lies on research and innovation, Key Enabling Technologies (KETs), internationalisation and EU Cluster policy. The Austrian Cluster Platform is responsible for the organisation of the annual Austrian Cluster Conference and the participation in the Alpbach Technology Symposium as well as to maintain five working groups and provides regular information. Furthermore a main objective is to participate in EU strategy processes and program developments. By systematic networking and participation of clusters in the further development of the Austrian research, technology and innovation policy, an important contribution is made to the development of fields of strategic strengths. Furthermore the careful coordination of regional and national policies is supported that leads to a significant increase of the ability to implement innovation policy measures in Austria. This working group was set up in January 2010 and focuses on the role of cluster organizations in supporting research & development and innovation. Since the start of the Lisbon process the EU has set a number of sustainable measures towards the strengthening of the European innovation capacity and its knowledge base. During the last couple of years “clustering” has increasingly been recognized as a pivotal tool for innovation politics. As a result, clusters and company networks respectively with SME focus were increasingly taken into consideration in the programme definitions of the fundamental EU programmes, such as Structural Fonds, H2020, COSME, etc. the consistent positioning of Austrian cluster interests in the European bodies. Objective of this Working Group is a support and advice of clusters in their internationalization activities in close alignment with the Austrian foreign trade strategies and the Austrian foreign trade organizations. One main focus lies on international technology cooperations. Industry 4.0, Knowledge intensive services (KIS) and service innovation are seen as main drivers for productivity, innovation and growth and are more and more in the focus of innovation policy. Clusters may support the development of Industry 4.0, KIS and service innovation through their activities and services. The goal of the National Cluster Platform is to strengthen the role of regional clusters in the national innovation system. We try to increase co-operation between national and regional level with supporting measures specific for cluster, especially for R&D and human resources. The enforcement of the co-operation between clusters and research institutions is another main target. The National Cluster Platform operates as a turntable between regional clusters and regional and international stakeholders.